As a “good wizard” I believe in supporting fair trade as well as environmental sustainability. Fair trade organizations, such as Ten Thousand Villages, pay artisans, farmers and others in the developing world a living wage for their work. I support this by buying coffee, chocolate, magic props and gifts from my local Ten Thousand Villages store here in New Haven, CT. I also support their fair trade efforts by performing “fair trade magic,” in the local store. I theme the routines to fair trade and use props from the store itself. Fair trade reverses the trend of creating poverty overseas so that we can have cheap and disable goods at home. 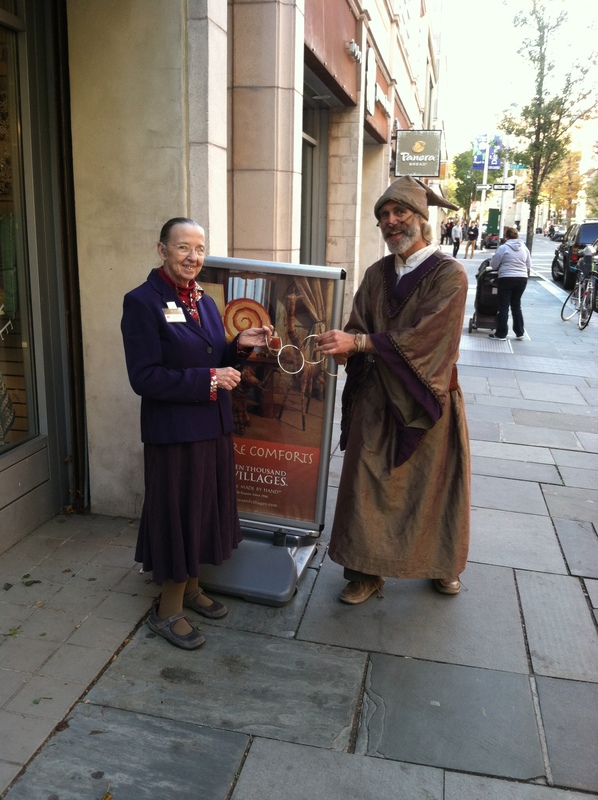 Liz Rider, manager of the Ten Thousand Villages store in New Haven, CT, has partnered with Cyril the Sorcerer to bring several performances of Fair Trade Magic to her location. This entry was posted in environmental magic, fair trade, sustainability and tagged Cyril the Sorcerer, environmental magic, Fair trade, Magic at Hawk Festival, Sustainability. Bookmark the permalink. Who Will Save the World?